This month is time for the Pike County Conservation District’s annual surface water monitoring field studies and sampling. 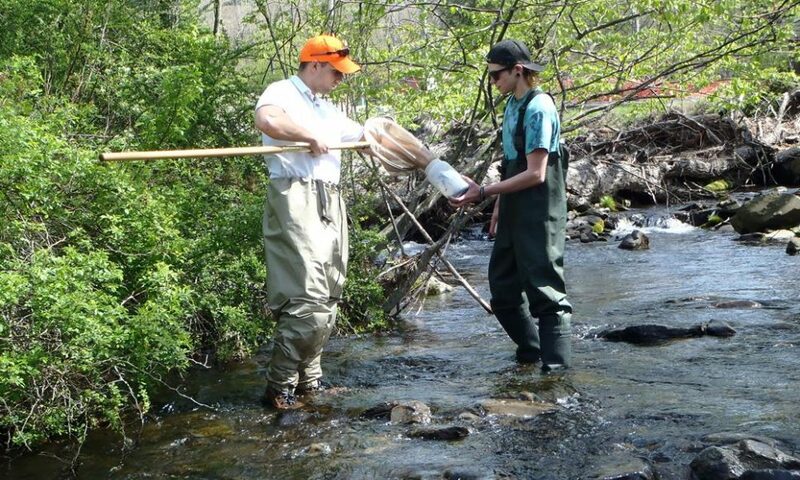 This year Noah Sargent, an Environmental Science student from East Stroudsburg University, volunteered to help the Conservation District staff collect macroinvertebrates and complete stream habitat analysis on Pike County streams. In the picture shown, Resource Conservationist Chris Ingulli and volunteer Noah Sargent are using a D-net to collect macroinvertebrates from the bottom of the stream bed. These Macroinvertebrates will later be identified and separated into stream quality groups. Along with the physical and chemical properties of the stream, these macroinvertebrates allow the district to analyze the water quality of the stream which they inhabit.